This report is generated from the Main Menu under Administration > Reports > Donor Total Summary Export. 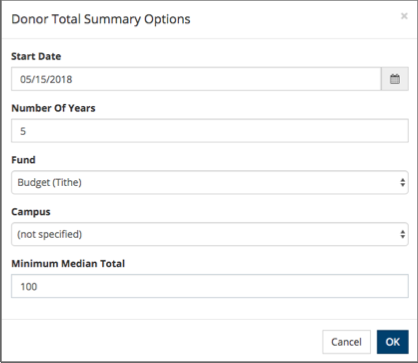 When generating the report, you select the date, number of years to compare, Fund (optional), Campus (optional), and Median Minimum Total. The report will combine family totals as a unit. This report looks backwards the number of years you specify, so the “Start Date” is actually the end date for the most recent year you want to compare. For example, if you enter a Start Date of 12/31/2018 and the Number of Years as 5, the report will compare 2014, 2015, 2016, 2017, and 2018. This page contains separate totals for Members and NonMembers with dollar amounts and the number of donor units, along with the mean and median for each. This page contains columns for dollar amounts from <=1K, 5K, 15K, 25K, 50K, 100K, and >100K showing dollar amount totals and the number of donor units. This page contains columns for ages ,= 25y, 35y, 50y, 65y and >65y showing dollar amounts and number of donor units.